Correlation is computed into what is known as the correlation coefficient, which ranges between -100 and +100 (some correlation charts use -1.0 to +1.00, but the scale alone does not change the correlation at hand). 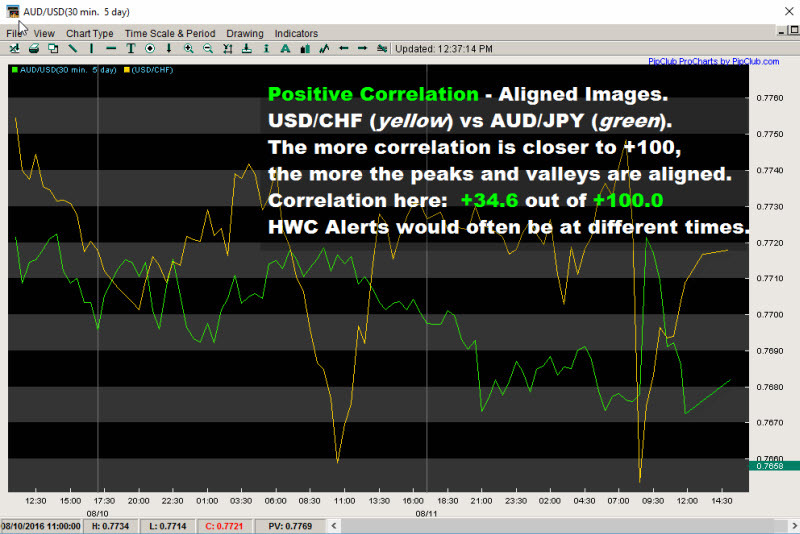 Perfect positive correlation (a correlation coefficient of +100.0) implies that as one security moves, either up or down, the other security will move in lockstep, in the same direction, and have its highs and lows often matching at the same times. If you place two highly positively correlated pairs on top of each other, it will look like almost two identical plots. Alternatively, perfect negative correlation means that if one security moves in either direction, the second security that is perfectly negatively correlated will move by an equal amount in the opposite direction. If you place two highly negfatively correlated pairs on top of each other, The plots would like like mirror images. If the correlation is 0, the movements of the securities is said to have no correlation and they move completely independent of each other. If one security moves up or down, there is as good a chance that the other will move either up or down, but the way in which they move in tandem is totally random. What is 'Time Dependence' and 'Period Dependence'? In order to be an effective trader, it is important to understand how different currency pairs move in relation to each Other. Regardless of your trading strategy and whether you are looking to diversify your positions or find alternate pairs to leverage your view, it is very important to know the correlation between various currency pairs and their shifting trends. There are several placed you can find Forex Currency Correlation Tables.I have listed a few below, but you can readily find merely by Googling for "currency correlation". Simply select two currency pairs you want to compare and the desired time period you wish to examine. This will allow you to discover current correlation and the historical data on the correlation you have chosen. 'Period Dependence' allows you to receive current data on correlation in dependence on the time period you are trading. What is the Deal with Currency Correlation ... Why Bother With It? What it comes down to is that currency correlation should be part of your overall money management strategy, as well as you how approach risk management. Let's say you have a choice of mutual funds in a 401.K ... you'd typically want some diversifications with your funds - blue chip stocks, health care, Pacific rim, high tech, etc. - to provide a balanced-risk approach to future growth. You wouldn't want to pick out five high tech stocks as the only mix in the portfolio (does the 2000 dot-com crash ring any bells?). My father-in-law lost several hundred-thousand in the 2000 crash as 95% of his stock picks where all high-tech, dot-coms! But, when it comes to trading, most traders see each trade independently, and that can be dangerous. Let's say you see the EUR/USD in an upswing and your trading strategy suggests a trade. You enter a buy. An hour later, your criteria suggests the AUD/USD is also prime for a trade. Do you take it, or not? Of course, the time frame you are trading must be considered. But, if your first trade is still exposed (you have not cleared your stop loss into profit), then you still have risk at play. Now here's were correlation comes into play. If the Aussie is highly correlated to the Euro, that means it will essentially be making the same move. You say, "Great, twice the profit". Yes, if the trades are successful. It could mean twice the loss, too! Why enter a second trade of the exact same move? That's not diversification of risk at all. If you feel so inclined, and the currencies are highly correlated, maybe it would be easier to add to the existing position of your Euro trade. After all, then you only have to track one chart, one currency pair, etc. Think about it. Or better yet, let the risk you have in that Euro trade play itself out. Successful traders know they don't have to take every trade, and there will always be "another" trade. FOMO ("Fear Of Missing Out") is the psychological driver of our uncomfortableness in thinking we are missing a trade, and it's one those emotional head-game things that must be overcome in order to be a successful trader ... a close cousin is FOF ("Fear Of Forfeiture") ... combine the two, and it can be lethal ... "The bonus expires tonight at midnight". It's how many marketers score their victories, but it is definitely not good for a trader to be emotionally driven by FOMO or FOF. In addition to risk doubling when trading two highly correlated pairs (either positive and in lock step, or negative and mirror image), there is also the time management consideration. If I have some sort of alert mechanism (from a technical trading perspective), highly correlated pairs will sound-off at nearly the same time. Example: Let's say you are trading 30-minute charts, and you have two highly correlated pairs. And, you have an alert for when RSI reaches a certain level ... you will be getting two alerts at the same time. It's not possible from a logistics standpoint to attempt to deal with opening two separate trades on two separate charts. Likewise, as mentioned, if they have a high degree of correlation, the risk is that they will be both win or lose as a set, and so if exposure is there (stop loss not yet at Break-Even), essentially, you are doubling your risk. If you normally put 2% risk into a trade, and you enter two highly correlated pairs simultaneously, it's just Math8 to understand you now have 4% of your account at risk. The odds of one winning and one losing is against you, it's not a hedged situation. You will either gain 4% or lose 4%. If you desire to gamble like that, just deal with one pair and trade your 4% there. Now, when you have uncorrelated pairs in your curreny-pair mix, the odds are you won't be getting alerts at the same time, and thus one trade will most likely clear it's stop to break even before you get an alert on another pair. Thus, if you take two traders who say they track four pairs, one may be trading with much higher risk if his/her pairs are highly correlated, compared to another trade (also with four pairs) whose currency pairs are not correlated. 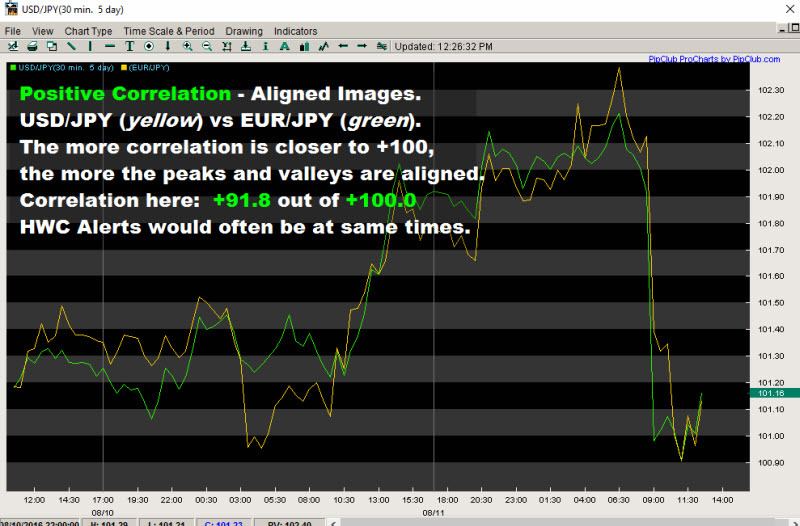 The currency correlation demonstrated by the charts you see below, or the data you see in tables via the links provided (or searches you may perform), are not static. Currency correlation changes within the time period being measured. 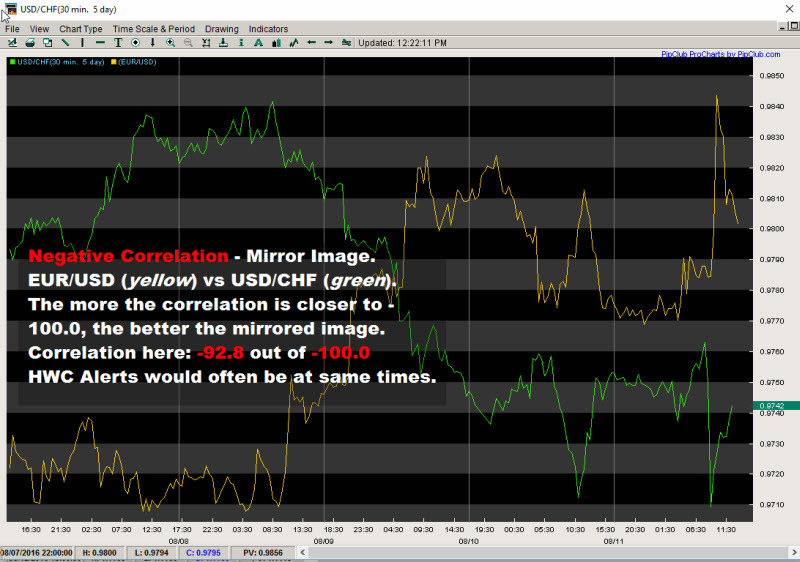 5-Minute currency correlation can obviously change dramatically throughout the day, 30-Min correlations can change to large degrees within the intra-day period, and so on. Never look just once and assume the correlation remains the same! Note: The use of HWC in the charts below references Harmonic Wave Convergence, a measure of price/wave exhaustion. HWC can be viewed as Swing High, Swing Low. 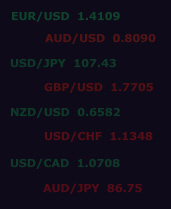 Some charting packsages, such as PipClubProCharts (Intellicharts), will let you overlay one currency pair on top of another (as shown with the examples above). If you prefer that visual over a table, merely ensure you choose the time period you are trading. While you don't get a decimaled-number to analyze from a table, you will be able to see approximate SH/SL correlations. © 2016 Steve Gregor. All Rights Reserved.